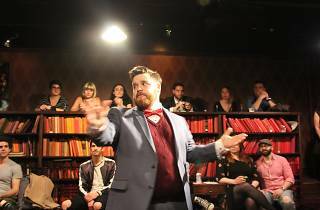 An actor drinks heavily (in the vein of Comedy Central's Drunk History) and then tries to corral others into enacting a story by the Bard. Bibulous excess is encouraged. Promotional description: The stage is set at the Lounge, a hidden library on 47th and Eighth featuring craft cocktails and more 15,000 real books. Five professional New York actors meet as members of the Drunk Shakespeare Society. One of them has at least five shots of whiskey, then overconfidently attempts to perform a major role in a Shakespearean play. Hilarity and mayhem ensue as the four sober actors try to keep the script on track. Every show is different depending on who is drinking…and what they're drinking! Only one can be King. Learn more about the exclusive King Experience. Performance schedule: Monday at 7:30pm; Wednesday at 8pm; Thursday at 7:30pm; and Friday and Saturday at 8pm and 10pm. Some weeks also offer performances on Tuesday at 7:30pm, Sunday at 7pm and/or Saturday at 6pm. Running Time: 1hr 30mins. No intermission. 21 or over only. Photo ID required. Offer for performances thru 4/28/19. Not all seats discounted. Discount code valid for stage-side, mezzanine and balcony seats only. All purchases with credit/debit, including online and phone orders, will incur a $4 processing fee. Blackout dates may apply. Schedule and cast subject to change. Offer subject to availability. No exchanges or refunds, all sales final. Cannot be combined with other offers. Not valid for prior purchases. Ages 21+ only. HEALTH WARNING: We do not condone excessive drinking. Our actors have a regular rotation system and are carefully monitored at all times. Drinking in moderation can be fun. Drinking to excess can ruin your life. We promote healthy drinking. Theater is wheelchair accessible. For groups of 10 or more, contact will@drunkshakespeare.com. What an awesome show! Went with a couple of friends and had a great time! Very talented/ funny performers and plenty of booze! Highly recommended! To be at Drunk Shakespeare or not to be at Drunk Shakespeare? Um...TO BE!! 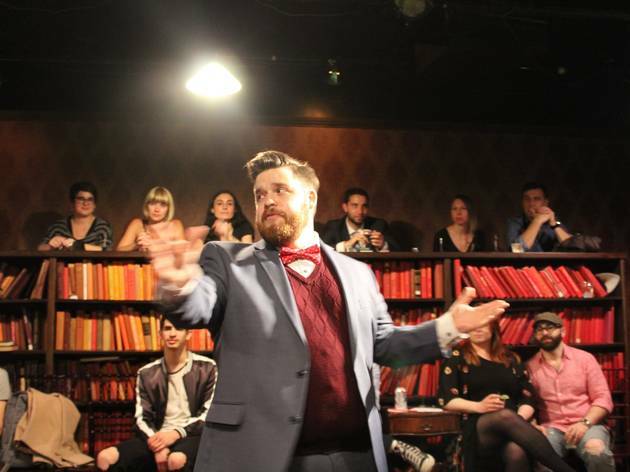 Get thee ASAP to the most intimate (and hilarious) theater experience in NYC. Purposefully entertaining and accidentally educational, this is a rare display of so many performance components done by absolute geniuses: improv, Elizabethan diction, physical comedy, audience interaction...it's like nothing you've ever seen. If tragedy + time = comedy, then a Shakespeare tragedy + whiskey = REMARKABLE. A unique and beyond-worth it experience for New Yorkers and visitors alike. One of the most unique and entertaining live performances out there! Aside from having very talented actors, and (obviously) tremendous source material to pull from... their use of the "drunk person" wildcard, and the setting that makes you feel like you're a part of the show, makes this a "must see" event for anyone who likes fun. They stuck pretty close to the Macbeth story and dialogue, but incorporated modern jokes and self-referential breaking of the 4th wall (I kept thinking it reminded me of Deadpool). Buy your tickets, grab a drink, check them out, and tell your friends! An amazingly fun and unique theater experience. A MUST SEE! Setting the stage with the magnetic, engaging and high energy personality of the Host Josh, the show was electric from start to finish with all of the awesomely talented actors! Loved the show! Amazing energy by all the performers throughout! All kinds of fun off the cuff moments! So much fun and entertaining. The actors and actresses are hilarious. I've seen this show multiple times over the past few years, and it's been such a phenomenal time each night. No matter who is in the cast that night, they're always so engaging and hilarious. My favorite part is how immersive the experience is while watching the show, it begins the moment you enter the theater space. Anytime I have friends who visit the city, this is the show I take them to first. Awesome show! Have seen multiple times and it's different every time! Each cast member brings something different to the performance and the drunk actor is always especially hilarious and anarchic. See this show! The show was really fun to watch EVEN if you aren't a Shakespeare fan. The cast keeps the audience engaged the entire act! A genuinely fun night out. Highly recommend it! I loved this show - it was interesting and hilarious at the same time! See it! One of my favorite nights out with friends! This show is a must see if you are considering any form of theater in NYC! JUST PLAIN HILARIOUS. Do yourself a favor and see this show asap. Don't miss it. Great for birthday parties, bachelor / bachelorette etc. Grab a drink and go. Truly a fun night out that will have you laughing nonstop. Awesome hidden library space filled with thousands of books, great drinks, and an incredible cast of actors who know how to drink! Hilarious! Not your traditional Shakespeare. You can drink throughout the show, hard to go wrong! This show was hilarious. Only bummer is we paid full price for tickets only to find out they were on Groupon at the same time :( but that was our fault. I was cracking up the entire time. Love the way they included the audience in it. The "stage" is also super cool. It's in a library, surrounded by hundreds of books all organized by color. The room is also pretty small so the show is right in front of you. You are also greeted with a shot, which was awesome. I would go back to see this again, which I can't say for a lot of shows! I'd imagine it would be different every time. Smart, funny and a great night out ! Have seen 3 times now and each time it get better ! Laugh Out Loud Funny Show & Performances By The Cast Are Outstanding! Josh Hyman Stands OUT - Hysterically Entertaining! I've seen this show over three times the last few years (with girlfriends and dates) and it gets funnier and funnier each time! Josh is hilarious and such an entertaining host. Keeps the crowds going and laughing all night long. Definitely a MUST SEE show for tourists and locals alike looking for a good laugh and fun night out. A fantastically cast show that is entertaining the entire way through, hosted by Josh Hyman, who is spectacular! I love this show because there is something enjoyable for regular theatre-goers/Shakespeare lovers AND people that have never been to a play before - which makes it an EXCELLENT go-to for groups. It is an intimate setting that feels like a secret society, and you become familiar with the actors as if you have known them your whole life. I have seen the show multiple times and there is always something different and exciting. The drunk actor is different each time and they always bring a different personality to the party and orchestrate the mayhem differently. Sometimes there's more Shakespeare, sometimes there's more outrageous surprises. Great date night. Great thing to do for something unique with friends! We had a great time seeing this show. The actors are hilarious, and one of them really drinks. The price is great and we had a very fun time! If you're looking for something different, come to Drunk Shakespeare. It's not done in the same way that most plays are and that's what makes it a great show. There aren't really any bad seats in the house. The mystery still remains: are the actors actually drunk or simply pretending?